The perfect summer picnic dessert! 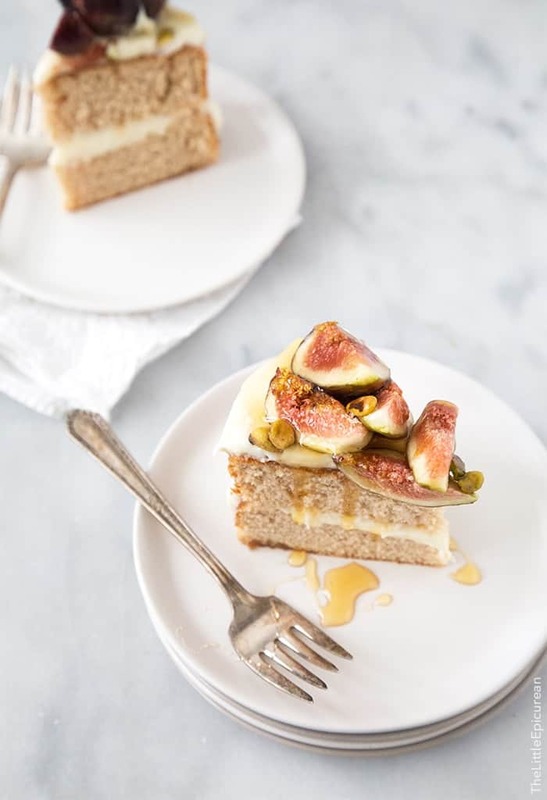 This fig cake is made with an Earl Grey based cake, frosted with honey cream cheese and topped with fresh figs and toasted pistachios. I once believed figs were chewy cookies. As a kid, if you told me that figs were fruits, I’d laugh in your face. To me, figs were cookies that came in a yellow box. Fast forward to my early teens and I was finally introduced to this lovely fruit. I recall my dad eating some one Saturday morning. In typical fashion, he was eating them over the sink. As I was making my breakfast, I noticed the beautiful interior of the fruit. Curious, I asked him what it was. My dad, who doesn’t like to explain things unless it’s about math or chemistry, just handed me one and said to try it. BAM. No explanation needed. I immediately fell in love with this sweet and delicate fruit. Last year I made this fig tart with pistachios and honey. I made it over and over again until figs were no longer in season. Now that figs are back, it’s only natural I try to make a fig cake. 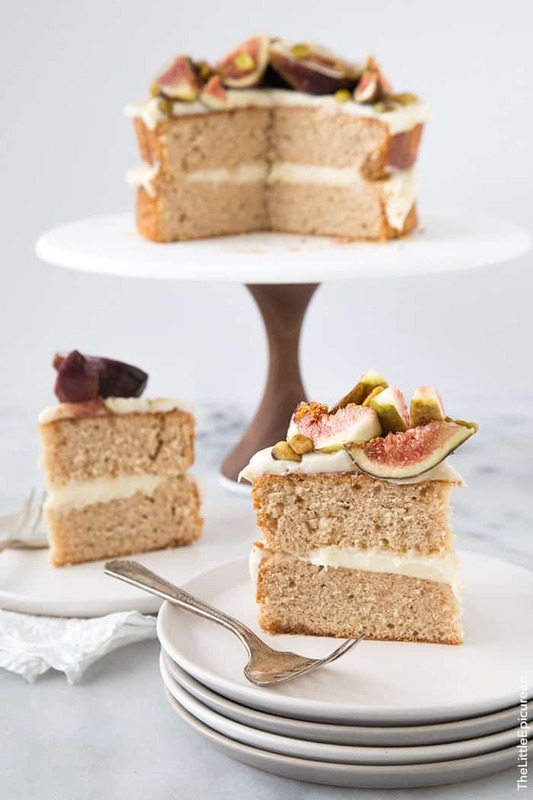 This honey Earl Grey fig cake is the perfect ending to a cocktail party, picnic lunch, Sunday brunch, pretty much any random or special day. I don’t really need any excuse to make it! Asides from figs, I love, LOVE, love Earl Grey tea. If it’s on the menu, you bet I’m ordering it- especially if it’s an Earl Grey based dessert. One of my favorite cafes in the area serves a delicious Earl Grey tiramisu. My favorite restaurant in Las Vegas makes an unforgettable Earl Grey cheesecake (I still dream about it). I used the cake base from my strawberry vanilla cake recipe. There are two ways to infuse tea flavors into baked goods. Yes, you need to use whole milk. (Or even better, heavy cream!) Why? Because flavor is transported through fat. Figs and honey are such a great combo (so is Earl Grey and honey!). The cream cheese frosting works well to enhance to the orange notes of the Earl Grey. If you’d like to make a proper frosted cake, don’t worry. There is plenty of frosting to coat the sides of the cake. Because it’s summer (and I like less work), I left the sides of the cake exposed. Lastly, because I feel all desserts need a little crunch, I sprinkled some pistachios on top. Microwave milk for 90 seconds to 2 minutes until very hot. Steep tea bags for 20 minutes. Squeeze out as much liquid from tea bags. Remove tea bags. Stir in egg whites and vanilla paste. Set aside. Preheat oven to 350 degrees F. Lightly grease and flour two 6-inch cake pans. Line with parchment paper and set aside. Sift together cake flour, baking powder, and salt. Set aside. In the bowl of a stand mixer fitted with a paddle attachment, cream together softened butter and sugar. Add 1/3 of dry flour mixture. Mix on low speed. Add 1/2 of liquid mixture. Continue to mix on low speed and add another 1/3 of dry flour mixture. Add remaining liquid mixture. Mix on low and add remaining 1/3 of dry flour mixture. Scrape down bowl as needed to ensure thorough mixing. Batter should be smooth. In the bowl of a stand mixer fitted with a paddle attachment, mix together cream cheese and butter until smooth. Scrape down bowl as needed. Add confectioners' sugar, honey, and salt. Mix until frosting is smooth and thoroughly combine. Level cooled cake as needed. Place one cake layer on a cake stand or cake plate. Spread a generous amount of honey cream cheese frosting into an even layer over cake. Place another cake layer on top. Top with frosting. 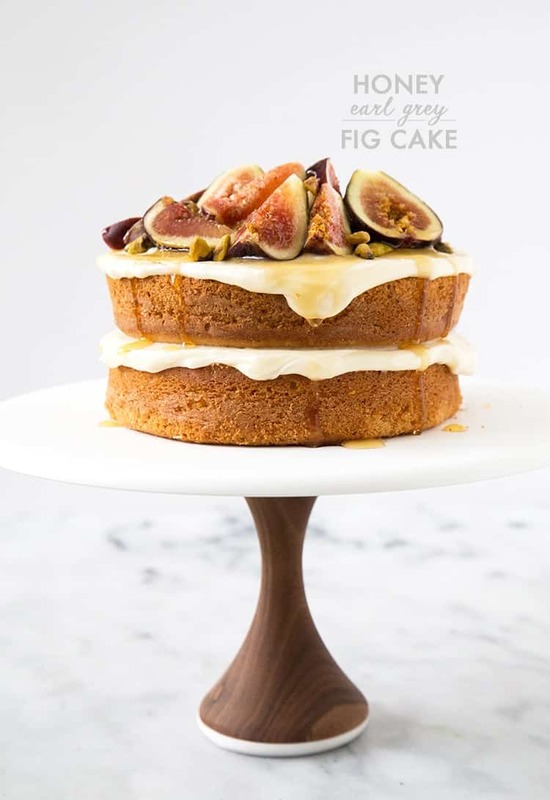 Place sliced figs on top of cake. Sprinkle pistachios on top. Drizzle honey as desired. Keep cake stored in the fridge until ready to serve. Let cake sit at room temperature for 20 minutes to allow cake to soften. Drizzle additional honey, as desired, before serving. This is just beautiful in every way!!!! You knocked it out of the park with this one! also obsessed with earl grey- it’s my favorite flavor of macaron, and recently tried (and loved!) an earl grey latte. Girlfriend this cake is absolutely stunning. Like I will be seriously dreaming about its perfection! Thanks Sara! I don’t want fig season to ever end! What a show stopper of a dessert – it looks fantastic! I love all the different elements, all special and awesome, and put together they create a lovely, complexly flavoured, cake. Thank you Amy! I hope your best friend loves it! 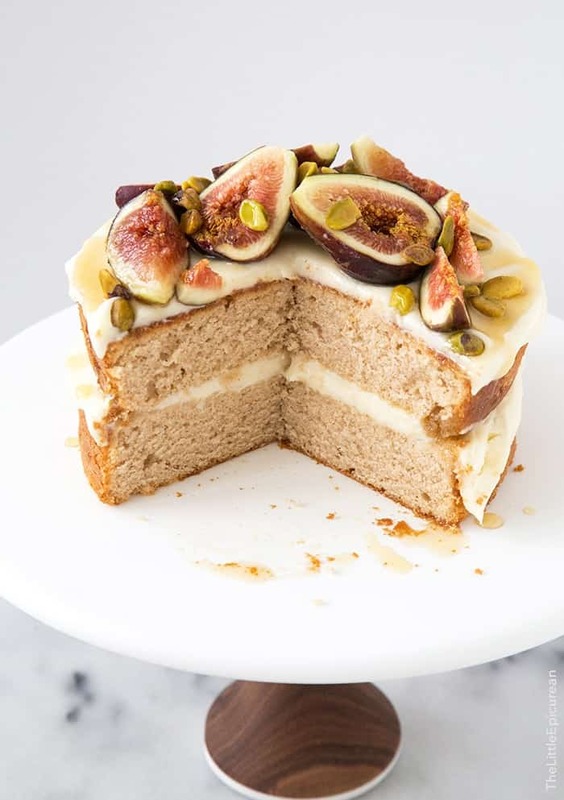 My family loves figs, and this is such a beautiful cake! Oh those fig newtons still take me back to my childhood and how they were ‘Mom’s cookies’ because you know, I wanted the chocoalte, caramel and peanut butter loaded cookies. None with fruit in it! Now as I approach my 30’s, I adore all things with figs. This cake is a beauty! This is one gorgeous cake! I love how thick the layers are. And the figs are a great touch! This is beautiful. If my cakes ever turned out this pretty, I’d be loathe to cut into it. Thanks Michelle! Slicing into the cake is always torture for me! 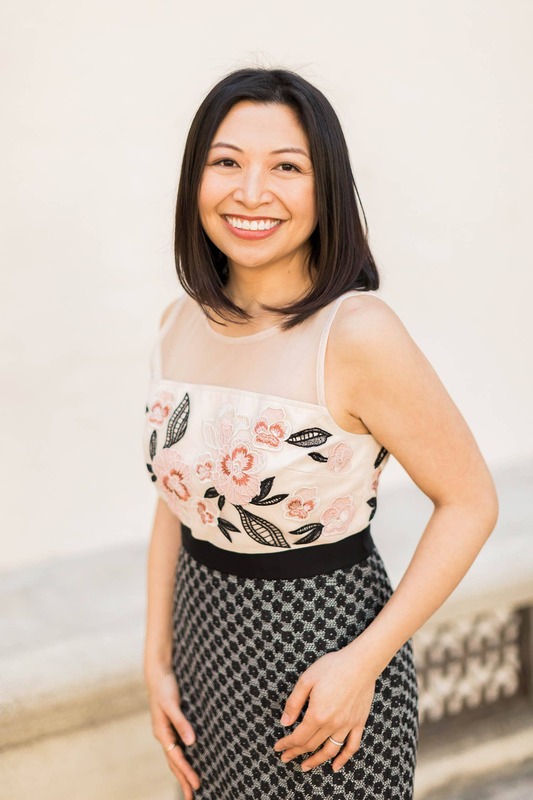 Gorgeous Maryanne! I have been dying to make things with figs lately! This is going to the top of the list! Thanks Mary Ann! I’ve been so obsessed with figs this summer. More fig recipes coming up soon! This recipe is calling to me – tea and figs and cake, pinkies out! This looks incredible! I, too, love all things figgy and Earl Grey-infused and this sounds like a delightful combo! Can’t wait to try this soon. Any suggestions for something to use instead of vanilla paste? I have extract and vanilla bean powder at home. Thanks for sharing this beautiful dessert! So keen for this when Figs are back in season down in Aus! Could you tell me the ingredients scaled for 9″ pans? Is it just an additional 1/3 of everything? Omg thus looks amazing and sounds delicious! Can’t wait to try! 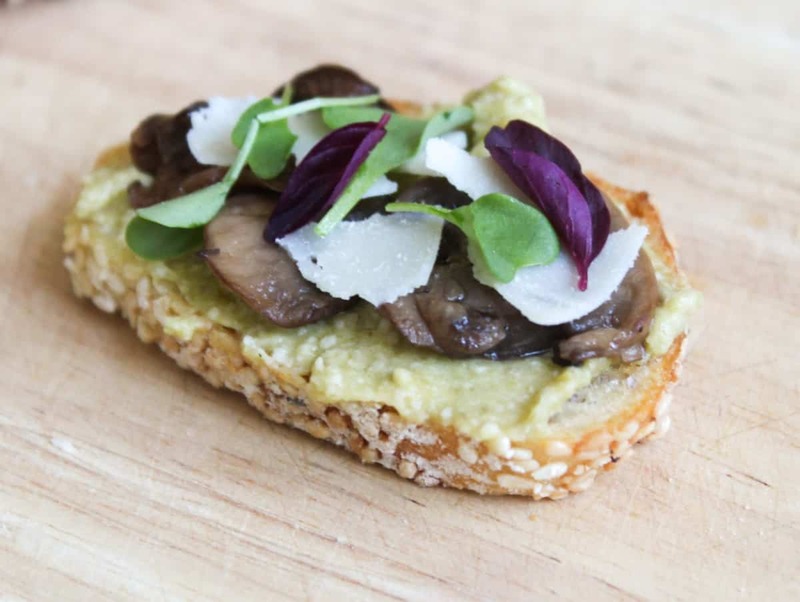 Do you think one could add chopped pistachios in the batter or substitute pistachios for walnuts in this recipe? If you add chopped pistachios in the batter, it make it a bit difficult slicing the cake. Yes, you can definitely sub in pistachios for walnuts to garnish the cake! This looks amazing, we had earl grey as a flavor for our wedding cake, I can’t wait to make this for my wife for her birthday this year. Additionally, that cake stand is gorgeous, any chance of you sharing where it came from? Hope your wife has a very happy birthday! That’s so sweet that you’re making her cake! The cake stand is from Aheirloom. They make great cake stands! Can I just ask if anyone has actually made this cake? 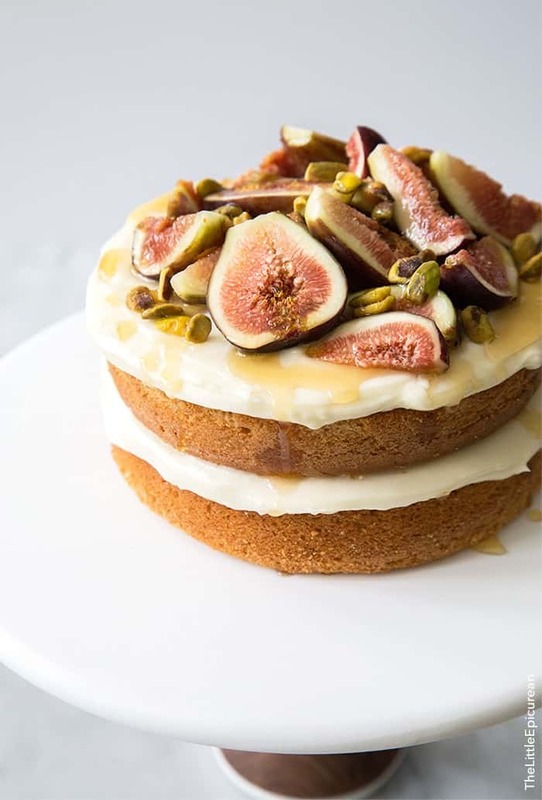 I’ve read a lot of the comments below and everyone seems to be saying how much they love figs, and how beautiful the cake is (which i agree with! ), but has anyone made it? I made it this evening and it was a disaster! A stodgy sponge with no trace of earl grey flavour. I am in England, so maybe I got the proportions wrong (I always find the whole cup/tablespoon thing difficult) I do wonder why not just weigh ingredients?? Anyway. it was unusable. I’ve made the icing, so am now baking a sponge to use it on, and I have the figs and pistachios, so hope it will come good in the end, but I have thrown the original cakes away! I just wanted to ask…was it just unbeaten egg whites as the recipe says? Is it plain flour not self raising (this is what google told me cake flour is). I’d be grateful to understand where I went so wrong! Many thanks! Hi. When younsay stir in egg whites, do you mean whipped or not? Simply stir the egg whites with the tea and vanilla until smooth. No need to whip it.